President Mahinda Rajapaksa said he considers India first and others later.“As soon as I came to power, I went to India and got their support; after that, I did not have to bother about the UN, UK, US, and so on. In fact, we got help from the US by way of vital information about LTTE ships which made it possible to destroy them at sea,” he said in an interview with Deccan Chronicle in Colombo. “As for China coming here with major infrastructure projects, I must tell you that every project that we gave the Chinese we first offered to India, including the big port project in Hambantota, but there was no response. 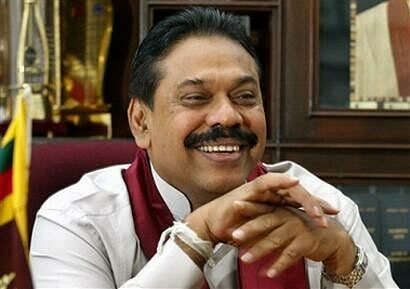 Even the Colombo port expansion was advertised but only the Chinese came,” President Rajapaksa said. Asked whether the Tamil National Alliance’s (TNA) victory at the last Parliamentary election indicated the existence of a strong demand for autonomy in spite of the elimination of the LTTE in view of the claims by the Jaffna Chamber of Commerce (JCC) that the Tamil Diaspora will not invest in the country until there is a political solution, the President said: “These elections were held under the proportional representation system. There was also a substantial number that voted against the TNA. You must note that 54 percent of Tamils live outside the north and the east. The JCC is free to have its opinion, but there are Sri Lankan Tamils abroad who have shown interest in investing in the north. President Rajapaksa also said regional autonomy was a slogan used by the terrorists and their apologists. “The need is for strong unity in diversity, for which regional autonomy is not the only way. A better approach would be equality of opportunity, and the spread of democratic freedom and rights, together with speedy economic development of the north, in tandem with other regions of the country,” he said. The President also said the Parliamentary Select Committee (PSC) is a good approach to what has been a vexed problem because in a democracy it is Parliament that will ultimately have to agree to any solution. “Unfortunately, the TNA has not named its representatives to the PSC. They (TNA) have the same attitude as the LTTE. They demand impossible things – merger of the north and the east, land policy and Police. See what happened in your country when Rahul Gandhi was travelling in Uttar Pradesh. Chief minister Mayawati tried to get him arrested. Do you think I want to get arrested by these people (by giving the Tamils a police force)?,” he asked. “The TNA seems to be driven by the Tamil diaspora, which does not want peace and political settlement, as they fear that their host countries might then send them back home. The TNA cannot represent the same separatist agenda of the LTTE, which will not find acceptance with the majority population. I want to work towards a solution but the TNA is not cooperating,” the President said. This is a good interview with Deccan Chronicle. Hon MR has respoded to the questions posed, very well.